John Stockton- Another one of the good guys. 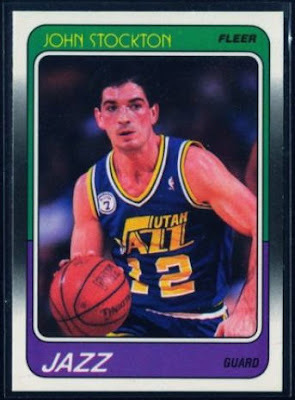 A soft spoken yet fiery competitor, Stockton honed his craft at Gonzaga, graduating in 1984 before being drafted by the Utah Jazz the following year. A 19-year league veteran who spent his entire career with the Jazz, Stockton, like Robinson, also posted a double-double career average with 13.1 PPG and 10.5 APG. He was also a 10 time All-Star with 2 Finals appearances. Stockton is the all-time leader in assists and steals and despite the demands of an NBA schedule, he only missed 22 games his entire career while helping the Jazz reach the playoffs 19 consecutive years. Again, unfortunately, his most popular rookie card also hails from another over-produced set in 1988 Fleer. His prices fair slightly better than "The Admiral's" with raw copies typically selling in the $3-$7 range. As you can see here. Another class act deserving of this honor, congratulations to another of the NBA's 50 Greatest Players of All-Time.